Place of Birth: Dallas, Texas, U.S.
Erykah Badu is an American singer, songwriter, record producer, disc jockey, activist, and actress. She is known for her soulful style of music, often labeled as nu soul or neo soul. She has worked with artists like The Roots, Common, and D’Angelo. Erykah has a son with rapper, actor, and record producer André 3000; a daughter with rapper The D.O.C. ; and a daughter with hip hop recording artist and record producer Jay Electronica. Information about Erykah’s DNA testing can be found here and here. Her genetic ancestry includes roots in the Bamileke people of Cameroon. Erykah’s paternal grandparents’ surnames were Wright and Wilson. Erykah’s maternal grandmother is the daughter of James Gipson and Odessa Bauchum. Odessa was the daughter of James William Bauchum and Phyllis Rebecca Alexander. 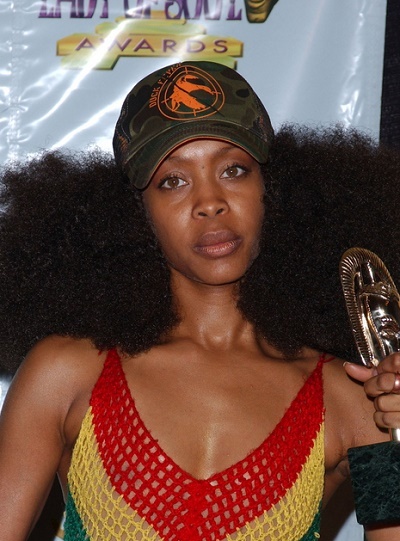 Erykah Badu is African-American PERIOD. Not half Nigerian lol! Badu isn’t even her real name. She does the whole Afro-centric artist thing well…but sorry, she’s just African American like me….with African slave blood from centuries ago! ERYKAH BADU is also half NIGERIAN!